new degree audit tool, Plan My Degree. Plan My Degree is now the official degree audit tool for UMKC. You can find out more about Plan My Degree by clicking here. 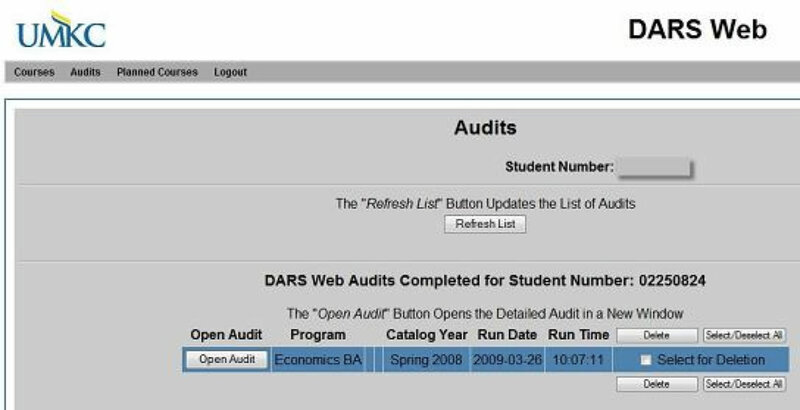 The Degree Audit Reporting System automatically generates a report reflecting a student's academic progress toward the completion of a degree. A student may request a degree audit for their major. In addition, a student may request "What If" reports for other majors they may be considering. The report automatically places the student's UMKC course work, transfer courses and courses in progress within a series of requirements and sub-requirements for a specific degree program. A degree audit is not a confirmation of requirement or degree completion. You must meet with your academic adviser to confirm progress toward earning your degree. B.S. Nursing - R.N. – B.S.N. Check back periodically to view the remaining degree programs and minors to be available. How do I run a DARSweb report? Click here. You will need to have Adobe Reader on your computer. DARS is intended to be viewed in Internet Explorer. The degree audits are available based on catalog year. If you do not see a degree program that is on the currently available audit list above consult your academic adviser about the catalog year in which the audit is available. You may need to run a “What If” audit in order to select a different catalog year where the degree audit is offered. 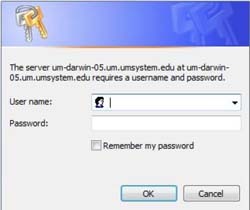 Enter you UMKC user name (use only lowercase characters) in the appropriate field. Do not include "@umkc.edu" when you enter your username. Courses will provide a list of the student's course work. Planned courses will allow the student to enter courses they plan to complete and select the grade they expect to earn. When an audit is run after the planned courses are entered, it will place the courses in the requirements they will fulfill. 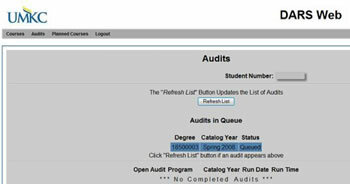 To request a degree audit, select Request a New Audit from the audits drop-down menu. The following screen will appear. The large blue area contains the student's current degree program. 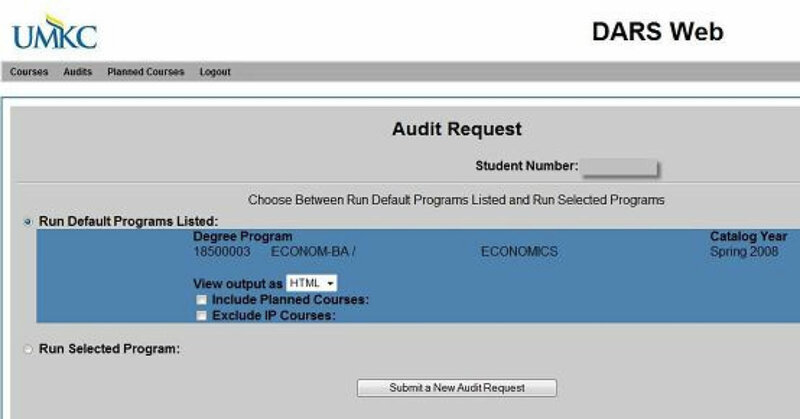 To request a degree audit for that specific degree program, select Submit a New Audit Request at the bottom of the screen. Requesting a degree audit that will include planned courses. Requesting a degree audit that will exclude courses in progress. The screen below will appear. The screen will hold this appearance for up to one minute until the audit is ready to be opened. The second screen below is how the screen will appear when the audit is ready to be viewed. To view the degree audit, select Open Audit. A partial audit for a test student is shown below. 10. 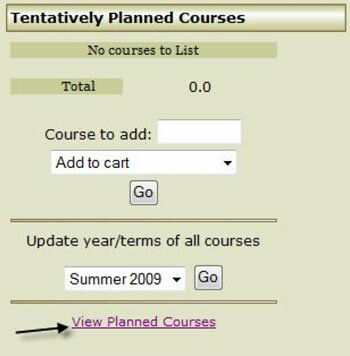 To see the courses in each requirement that have been completed or "select from" courses that will complete the requirement, select the tiny arrow beside the solid green check mark or the red "X". What is a degree audit report? Click here. The degree audit is an automated report reflecting the student's academic progress toward the completion of a degree. The student may request a degree audit for their major. In addition, "What If" reports may be requested for other majors the student may be considering. The report automatically places the student's UMKC course work, transfer courses and courses in progress within a series of requirements and sub-requirements for a specific degree program. Does the degree audit replace the academic adviser? Click here. No. The degree audit report is a tool used by both academic advisers and students. The student should not rely on the degree audit without consulting with his or her academic advisers. The Registration and Records Office and the academic advisers make every effort to maintain accurate degree audits; however, there are often exceptions to be entered for individual students. The degree audit cannot replace one-on-one contact with the student's academic adviser. How do I run a degree audit report for a double major? Click here. Students with double majors should request a separate degree audit for each major program. How is transfer work from another institution used in the degree audit report? Click here. The report shows how transfer work that has been entered in Pathway will apply toward your degree requirements. How do I find courses to complete the requirements? Click here. Courses that will fulfill a requirement can be found within the requirement, by speaking to your academic adviser, or on the Major Maps site for the degree program. How do I print a degree audit report? Click here. To print the degree audit report with all of the requirements closed, select Close All Sections and Printer Friendly at the top of the audit. When the printer-friendly version appears, print as usual. 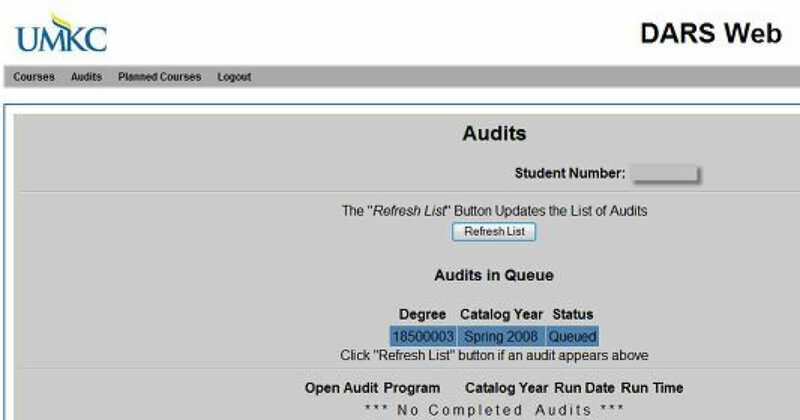 To print the degree audit report with chosen requirements open or closed, open or close the chosen requirements by selecting the tiny arrow to the left of the requirement number. When all sections are open or closed as they are supposed to be, select Printer Friendly at the top of the audit. When the printer-friendly version appears, print as usual. How do I enter planned courses into the degree audit report? Click here. Choose a course from the Select From lines below in the requirement. Some requirements will not display specific courses, but specific course subjects to choose from. See the current course catalog for courses offered in that subject area or meet with your adviser for course suggestions. Enter the course in the Course to Add field in the upper left portion of the degree audit report. Enter a space between the curriculum name and the course number itself. 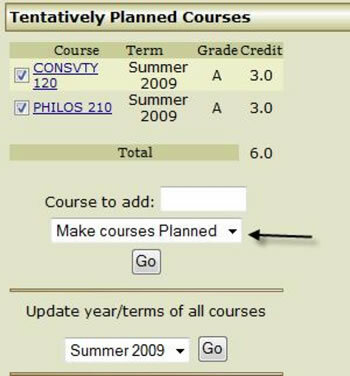 From the pull-down menu, select the term in which you plan to take the course. Select Go. The course will appear in the course cart. If you wish to enter other courses to be taken during the same semester as the first course, enter them in the same manner and select Go following each entry. 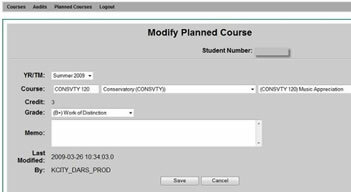 How do I enter an anticipated grade for a planned course? Click here. 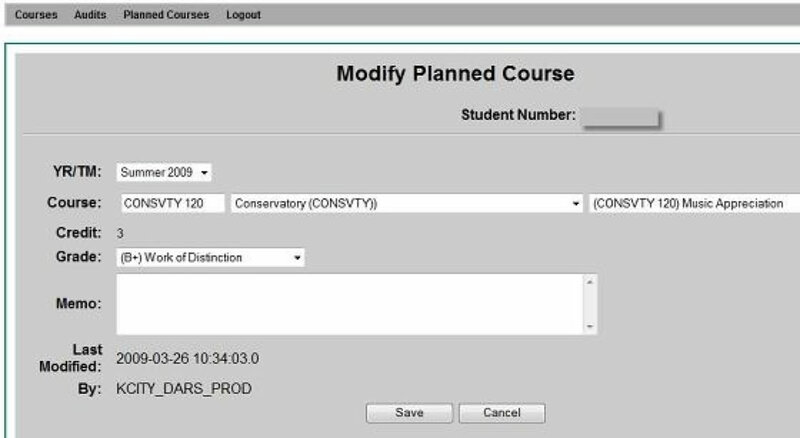 To return to the view planned courses screen, choose Planned Courses on the menu bar and select View Planned Courses from the drop-down menu. How can I see how planned courses will affect my degree audit report? Click here. 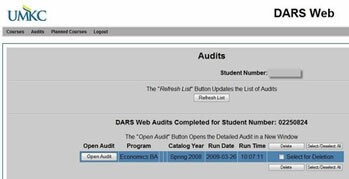 Choose Audits from the menu bar and select Request New Audit from the drop-down menu. This choice can be made from any of the top menu toolbars in DARSweb. 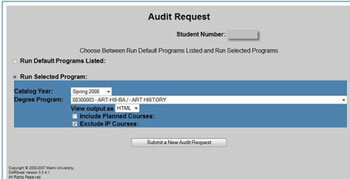 On the audit request screen, check the box beside Include Planned Courses. Select Submit a New Audit Request. 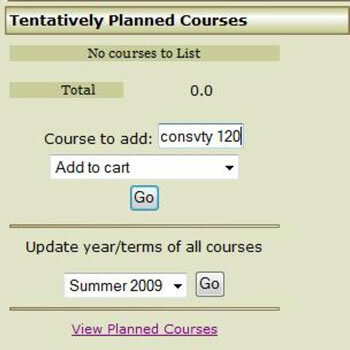 Planned courses should appear within the requirements to which they are assigned. The PL+ indicates that the planned course will fulfill the sub-requirement. The >W indicates that this is a "What If" course. How do I run a "What if" degree audit report? Click here. 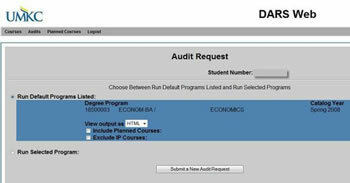 From the audit request screen, select Run Selected Program. 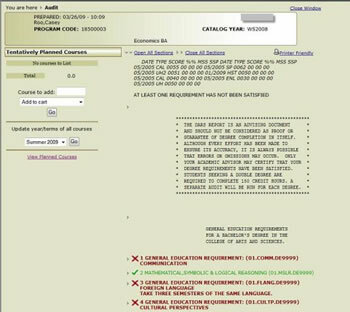 From the Degree Program drop-down menu, select the degree program for which you would like to run a "What If" degree audit report. 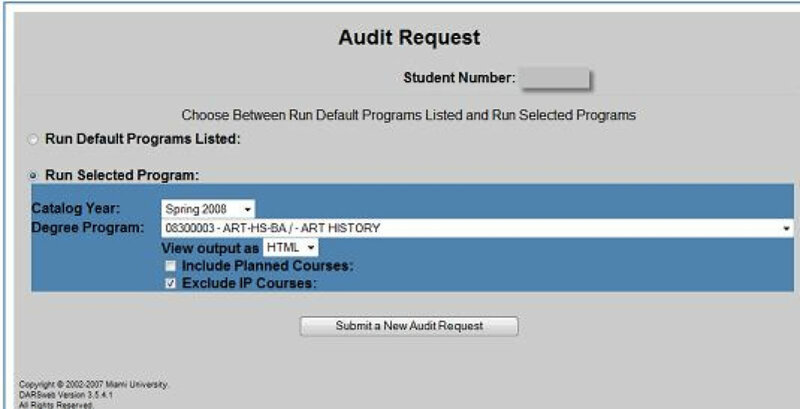 How do I run a degree audit report with courses that are not currently in progress? Click here. From the audit request screen, check the box beside the Exclude IP Courses field. How do I run a degree audit using a "paper-saving" method? Click here. On the audit request screen in the Audit Output field select PDF. When the audit moves to the wide blue section, select Open Audit. You will be asked to select Open, Save or Cancel. Select Open. Select the printer icon on the toolbar. Select OK from the message that appears.